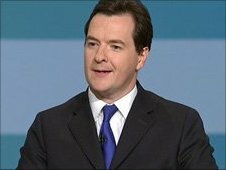 Chancellor George Osborne has announced that child benefit is to be axed for higher tax payers earning £44, 000 or over. The measure, which will start in 2013, will affect any family where one parent earns around £44, 000. I find this confusing and unfair that a single parent could be affected, whilst two working parents earning £35, 000 each would not. I’m getting flash backs to Prime Minster David Cameron’s election campaign, with his huge emphasis on family. Surely this completely defeats his point? My interpretation of this campaign speech was that families would benefit, so surely there will have been plenty of better off families voting under this false pretention. So, many wealthier familes voted Tory for lower taxes and to be rewarded for having a good attitude to the importance of family. I doubt they saw this coming. Osborne did seem to push the fact that he had no other choice on the matter. He implied that it was Labours fault that he was left in the mess in the first place, yet I am still doubtful. Labour argues that the benefit should remain universal and the families who wanted to “get on” were being penalised. The change is estimated to affect 15% of families. Osborne believes it to be a fair measure, and thinks that the public will agree with him. He also said that there will be limits on the amount of benefits families will recieve, so it would be no higher than the wages of working families. Osborne defends the move by saying that the alternative would be a complex analysis of each family income. Personally, I feel that this would be a much fairer option. At school I was one of the few who didn’t recieve EMA (help towards education). This didn’t seem fair to me when my widowed mother worked extremely hard as a nurse to provide for my brother and I, whilst people in my class lived with their mother and got the full EMA, whilst divorced ‘Daddy’ earned a mint. It would seem that no-one is safe from the cuts. The Child Poverty Action Group said it was “unfair” that families should be paying the price for a debt crisis not of their making. Also, with the recession still in full blow wealthier families situations may change. Is the so called ‘Welfare State’ still something we could call ourselves? Who is going to help those hard-working Mum’s, who may even sacrifice time with their families to support them, if they end up in crisis? This whole debate draws me back to the recent debate over bus passes being cut for the wealthier elderly. Whilst it has been argued that many people who are given the free bus pass are still working into their 60’s, this is one of the few privilidges I think that elderly people deserve and should not be axed. ← What Would Virginia Think?